/ Why is my airbag light on? went over railroad tracks a bit too fast and the light has been on since then, but the bags have not deployed. I've had the same problem on my 2013 Elantra. I got a run-around answer about my bag being in the passenger seat & it being too heavy. Neither of which are true. I will definitely keep on them about this. Thank you for your answer, Js08016! Do you know if it is a common problem? I called and took it in because that whole not deploying part was a little unsettling. It turns out the scale was not calibrated correctly. At least that's what they said. Either way the issue was resolved. We have the same problem with our Elantra...we had some electrical problems and after having to disconnect the battery the airbag light comes on all the time. We have a 2010 Elantra Touring. The air bag light is in constantly. Took it in to the dealer and my regular guy, both said it was a "switch" in the passengers seat that required the entire seat bracket to be replaced. Both quoted $2,500 +/-. Any advice for a less costly solution would be appreciated... PS- both said the light would not prevent deployment, so JS08016's comment is a bit disconcerting. My mother and I both have 2010 elantras and the airbag light has appeared on both of our cars. She had to pay $250 just to fix the issue. I have yet to get it done. I was thinking about trading it in for a newer model but there always seems to be issues with this car. People really need to call NHTSA about this: This is a safety system defect and should be fixed for FREE under a recall for all of these vehicles. I have 2012 Elantra and my airbag light stays on...they said it's the clock spring..cost $395.really???? This shouldn't be. so any responses that help? Lots of complaints, I also have an out of warranty 2012 elantra and would like my airbags to work if I'm in an accident, paying 99 to "evaluate" the light and no clue of what it will cost AND having to leave my car at least a day with them and get a rental does not seem like an option and YES seems as though this should be a recall issue!!! same here with my 2011 Elantra, out of warranty after 5 yrs and 3 days, Airbag light on, steering wheel controls like car volume, mute, scan, fwd/back, cruise control, etc.. not working anymore. At first it was intermittent for 1 month, works here and there 1 out 5 tries, but now 100% dead. I was shopping for a new car for my daughter over the long Labor Day weekend, I was about to get another Hyundai Elantra (2016), sales rep offering me 1k off from msrp as a return customer. 19k otd and all. I decided to walk away. Too risky for loved ones to drive a Hyundai. 2005 Elantra had airbag light on after an frontal collision but before it was on and off. Will get a scanner to read the code. If you get codes B1448, 1449, 1450, then call your dealer and they will reprogram it for free. I have 2013 Elantra and all of a sudden Airbag lights popped up. I notice if I lock the seat belt on rear seat it goes off and lights up again. I have a 2012 Hyundai Elantra with the very same issue. Any hope of it being fixed for free? Also 2012 Elantra. Went over some brick pavers and it now blinks on and off intermittently, but is mostly on. Interestingly, the other person who had steering wheel accessory control issues may also be on to something, as I've had those pop up a couple times as well. If lights on means air bag is disabled.thats good.Don't have to worry about fixing it soon.It can;t hurt the car being on.Thanks a lot for the advice. My husband sprayed t he wires to air bags and the light went off.No worries anymore.It's on a 2003 cadilac. https://www-odi.nhtsa.dot.gov/VehicleComplaint/ Above link is mainly for US country. May I know is anyone have Malaysia link to file a similar complaint for Hyundai Elantra? I opened the Hyundai Elantra Extended Warranty on 07/03/17 and thought, wow that was nice of Hundai to automatically extend the warranty on the clock spring and steering rubber coupling. I kid you not that my wife texted me a picture of the airbag light being on in the dash as she pulled into work the morning of 07/05/17. Uncanny the timing of it really. I just found this string of question/answers and feel like it is 99.9% the clock spring mechanism as it has come up with other 2012 Hyundai Elantra owners. Ours also happens to be a Limited Edition, so I don't know if those are more prone to the issue. We have roughly 68,000 miles on the car. We will be going into the dealership this afternoon to have it fixed as the issue of the airbags not deploying in the event of an accident is worrisome. Thanks to all those who have posted in the last few years and have probably contacted the NHTSA and or Hyndai about this problem so that they would do something about this safety issue. I guess they don't technically have it listed as a safety recall at this point, but it should be made a safety recall issue. I think the warranty letter just says to bring it in only if it experiences the issue, but it sounds like a good percentage of people are experiencing this issue as of the last 4 years. Thank you everyone!! I have a 2013 Elantra with the intermittent air bag light also. Plus my cruise control no longer works, I wonder if it's all electrical?? I thought Hyundai was supposed to be a better car than average??? I have 2002 elantra ,gals original owner one hundreds,and thirty miles,air bag on constantly,also cracked dash board,pretty bad,is this a defect. Debbers411, those are the exact symptoms of a bad clock spring. Hyundai extended the warranty. I like to think it is because of my very we'll received NHTSA complaint, but even though the timing was within a couple months of my filling, many others had done the same. Take it in to the dealer and have them check it. It takes only minutes to diagnose. Then, they file with Hyundai to get the part and about a week later you can make an appointment to have it installed. Takes less than an hour labor to do. I just wanted to thank the individual or group of people that did the leg work to get Hyundai to take ownership of this safety issue. Great job, I brought my car in today for the airbag light. You're a life saver! 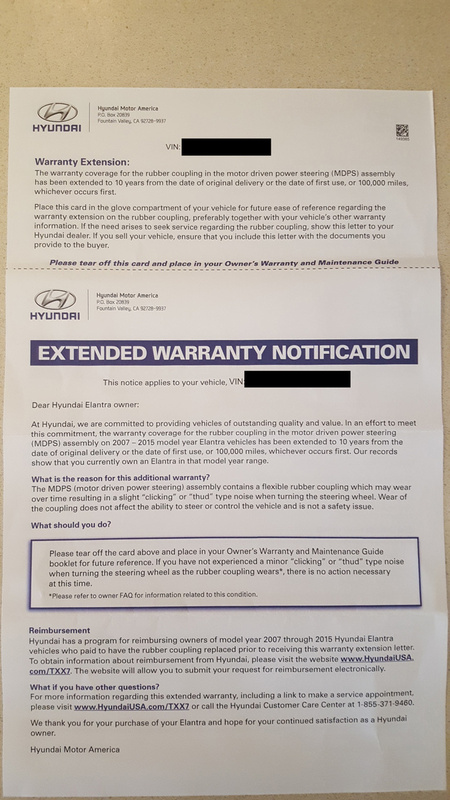 How do I get a letter from Hyundai extending the warranty?? I have the same issue with the air bag light. So I just print it an take it to the dealer with me?? I don't have to have an actual letter from Hyundai?? Yeah as Tim mentioned, just use the letter i posted earlier on the forum and that will be fine. My sister has the same Elantra as mine and she didn't get the letter, but was able to use the info from mine to get her repairs paid for. Ok. I will print the letter and take it to the dealer. Thanks for the information!! To be frank dealership did not even ask me for the letter. When i said that they have extended the warranty they did it for free. Have an extended clock spring warranty repair appointment set for Monday. Thank you to all of you folks who made waves with the NHTSA. Glad I waited before paying to have it repaired. I have a 2014 Elantra with air bag light on. When I put in my vin only the extended warranty for the steering wheel comes up not the clockspring. Doesn the warranty not apply to 2014? 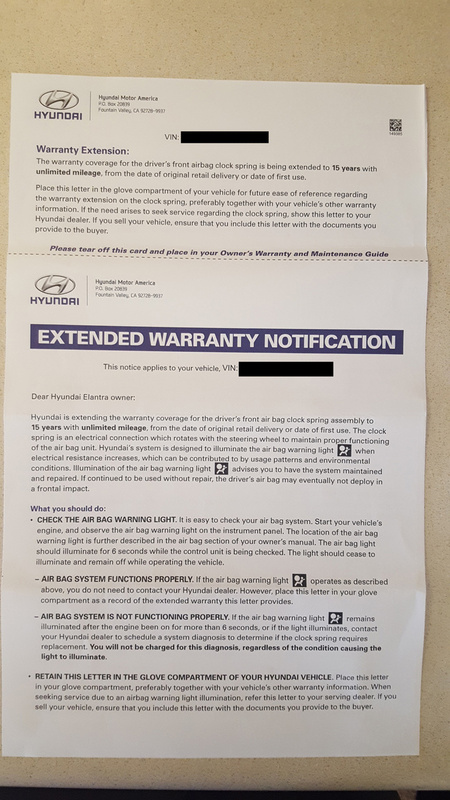 I just started having the same issue - bought a used 2012 Elantra seven days ago - has 68000 miles - airbag light came on 2 nights ago - took it back to the dealership today - culprit was that clockspring - they didn't even request the letter from Hyundai that poster Taku so helpfully included - they repaired it - no charge - drove home and it's all good - thanks for sharing all posts - really helps! car was fixed new alternator new battery all of a sudden the air bag light is on steady. My IP LIGHT CAME ON I PUT BRAKE FUILD brake in. The light when away and came back on. CarGurus has 51,856 nationwide Elantra listings starting at $1,000.